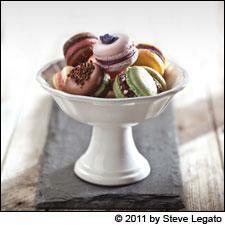 Pairing shells and fillings is part of the creative fun of baking macarons at home. The deepening fall season brings ghosts and goblins in their Halloween finery, crunchy leaves and cool air, and the chance to make and enjoy grown-up desserts that owe more to Julia Child than Willy Wonka, along with some decadent dessert wines. To assist you with the latter pleasure, we have provided a list of recently rated sweet wines, below, that reflect a range of styles and price points. As for the desserts, we're happy to note that fall has also brought to the market a beautiful, timely and instructive new cookbook, Les Petits Macarons, by Kathryn Gordon and Anne E. McBride. Gordon is a chef-instructor at New York's Institute of Culinary Education; McBride is a food writer and editor, and a PhD candidate in food studies at New York University whose previous book collaborations include Chocolate Epiphany, written with pastry chef François Payard. Macarons are almond flour and meringue-based cookies with crisp exteriors and soft, slightly chewy interiors, most often sandwiching a sweet filling. In the book's brief but comprehensive history section, we learn that Ladurée, the nearly 150-year-old Parisian pastry shop, first offered the delicate sandwich cookies in the early 20th century. Macarons have enjoyed increasing popularity in the United States, with French-style pâtisseries like Thomas Keller's Bouchon Bakery, in Yountville, Calif., and New York, offering the jewel-toned confections by the piece, often at a premium price. Maison Ladurée recently opened its first U.S. store, in New York, where customers happily wait in lines that snake around the block. Macaron fever is perhaps a sophisticated outgrowth of the cupcake trend, said McBride. "Instead of buying cakes, people are buying sweets by the piece," she said. "It's very controllable. If you can't commit to one flavor and want to try a lot of things, with macarons, you have the opportunity. You wouldn't eat five different slices of cake, but you can eat five different macarons." And now, thanks to the book, with its extensive and clearly-written instructions for every step of the process, plus a thorough troubleshooting guide, you can make macarons at home. The book provides the complete method for three different styles of meringue (French, Swiss and Italian), along with "Kathryn's Easiest French Macaron Method," which does not require the beginning baker to make a meringue at all. In addition to a wide range of recipes for sweet shells and fillings, Les Petits Macarons also includes an intriguing savory section, with recipes like black pepper macarons filled with foie gras and black currant gastrique, and a filling of duck confit with Port and fig, meant to be sandwiched by hazelnut or orange-flavored macarons. The recipe below, with its coffee, chocolate and caramel flavors, would pair well with any number of dessert wines, and would make a fine treat on Halloween and into the fall and winter. Before you begin, make sure you have on hand baking sheets, a silicone baking mat or parchment paper, pastry bags and an electric mixer with a whisk attachment. 1. Preheat the oven to 200° F. Stack two 18x13-inch baking sheets on top of one another. Line the top baking sheet with a silicone mat or parchment paper. Cut additional sheets of parchment paper, if using, at the dimensions of the baking sheet to pipe additional batches. 2. Place the almond flour, confectioners' sugar, and salt in the bowl of a food processor and pulse 4 times for 3 seconds each to combine them. Scrape the sides of the bowl in between pulses with a spatula. Sift with a fine-mesh strainer onto a sheet of waxed paper. (If you simply sift the flour and sugar together without processing them first, the macaron will not be as smooth-skinned.) Stir the espresso powder into this mixture and set aside. 3. With a hand whisk, whisk together the powdered egg whites and granulated sugar in the bowl of an electric mixer. Whisk in the egg whites and cream of tartar until the mixture is homogenous. Set the bowl and whisk attachment on the mixer and whisk on medium speed until the merignue is glossy and forms stiff peaks, about 11 minutes. Once the meringue reaches stiff peaks (the whisk will leave marks in the meringue as it goes around in the bowl) and resembles marshmallow fluff, stop the mixer. Turn the bowl upside down to check that you have reached the right stage: the meringue should not slip in the bowl. 4. With a spatula, quickly fold the sifted dry ingredients into the meringue. Stop folding when the batter appears to be 90 percent incorporated, scrape the sides of the bowl, and fold in the yellow food coloring with 1 to 2 more strokes. 5. Spoon the batter in a pastry bag fitted with a 1/2-inch round tip (alternatively, cut a 1/2-inch opening in the bag). Fill the bag halfway, leaving the rest of the meringue in the bowl while piping; cover it with plastic wrap while a batch is in the oven. If you overfill the bag, you will not be able to squeeze it hard enough to pipe even, tail-less shells. Twist the top of the bag to close. Pipe the meringue on the silicone mat into quarter-sized mounds, 1 1/2 inches apart from one another. 6. Bake the shells at 200° F for 15 minutes to dry out the shells. Increase the oven temperature to 350° F and bake for an additional 9 minutes, until the foot and edge of the shells feel firm and they just come off the silicone if you lift them. Remove the shells from the oven. Slide the silicone mat or parchment paper onto a cooling rack and let the shells cool completely, about 1 hour. 7. To fill the shells, spoon the caramel filling into a pastry bag and cut a 1/4-inch opening at the tip. Pipe a small amount of caramel, about 1/4-inch thick, on the flat sides of the shells. Don't let the caramel go all the way to the edges of the macaron. Top with another shell, twist it slightly to secure the filling, and let set in the refrigerator, about 10 minutes. 1. Heat the cream in a saucepan over medium heat until scalding, about 3 minutes. 2. Heat the sugar and lemon juice in a medium saucepan over medium heat. Stir with a wooden spoon or a heat-resistant spatula to "rub" the juice into the sugar until the sugar resembles wet sand. Cook until the sugar syrup turns a clear amber color, the edges begin to foam, and you can smell the caramel, about 10 minutes. Stir only if the sugar does not melt evenly. 3. Remove from the heat and immediately pour in the cream to stop the cooking process. Keep the pan away from you to avoid splatters. Whisk in the chocolate and vanilla, pour the caramel into a container, and let it cool at room temperature for 2 hours. Cover, then refrigerate for 12 to 24 hours. Makes 1 1/2 cups, enough for 40 small sandwiched macarons. Note: The following list is a selection of outstanding and very good wines from recently rated releases. More dessert wines can be found in our Wine Ratings Search. This exotic wine is starting to show burnished, mature flavors of citronella and lanolin, along with marzipan, date, creamed papaya, ginger and dried apricot. A twinge of green tea keeps this going through the finish. Drink now through 2015. 2,083 cases made. —J.M. A ripe, flashy style, with layers of creamed peach, Jonagold apple, candied citrus peel and dried apricot, all stitched with lovely acacia honey and floral notes. This has power and purity. Drink now through 2022. 3,500 cases made. —J.M. Pungent, showing aromas and flavors of truffle, decaying apple, honey and rhubarb. This is compelling for its luscious texture and racy acidity, leaving a fresh and harmonious impression. Drink now through 2020. 4,900 cases made. —B.S. Rich but nicely focused, with bright tangerine, white peach and creamed melon notes and a long, golden raisin–tinged finish. Round and very flattering. Drink now through 2022. 2,333 cases made. —J.M. Rich and lush, with concentrated glazed apricot, lemon, buttercream and baked apple flavors. The long finish features spice and white chocolate. Drink now through 2030. 20,000 cases made. —K.M. A bright, high-toned style, with glazed pear and peach fruit aromas and flavors backed by flashes of candied green plum and heather honey. Quite sweet on the finish, but long and pure. Drink now through 2021. 2,915 cases made. —J.M. Flavors of Poire William, candied grapefruit and light spice flavors grace this sweet-tart dessert wine, which is balanced and leaves a mouthwatering impression on the finish. Drink now through 2018. 3,500 cases made. —B.S. This shows a spicy nose, offering fresh cherry flavors supported by medium tannins. Finishes with chocolate and cream. Drink now through 2020. 5,000 cases made. —K.M. Lightly sweet and deftly balanced to showcase the open-textured walnut, coffee, jasmine tea and spice flavors that linger on the relatively quiet finish. Drink now. 10,000 cases made. —H.S. There's lots of honey and apricot flavors in this rich, lively sweetie. The light, creamy finish exudes a buttery essence. Drink now through 2020. 12,000 cases made. —K.M. Sweet and silky, balancing its roasted hazelnut, coffee and bitter chocolate flavors with a thread of cherry. The finish lingers gently. Drink now. 7,300 cases made. —H.S. A ripe, flattering style, delivering lots of up-front apricot, hazelnut and candied orange peel notes, backed by a broad, honeyed finish. Drink now through 2016. 5,350 cases made. —J.M. This thick, rich wine has the color of mud, yet it shows life on the palate, with walnut, maple and prune flavors joined by a bracing thread of acidity. Drink now. 25,000 cases made. —T.M.